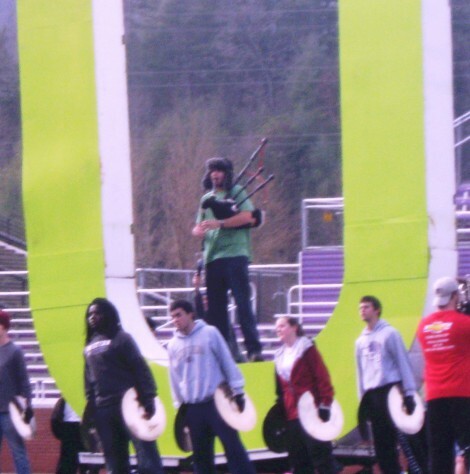 Among the unusual instruments incorporated into the Pride of the Mountains Marching Band “Rock U” field show is bagpipes, and playing the instrument is Ezra G. Byrd, a freshman tuba player majoring in secondary history education from Mebane. 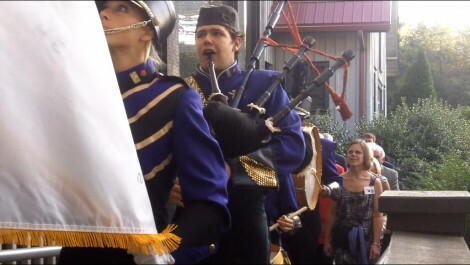 Ezra Byrd plays bagpipes as well as tuba in the Western Carolina Unviersity Pride of the Mountains Marching Band. Byrd performed in a procession at a reception (pictured here) in honor of Rose Parade president Jeff Throop and his wife Angel. Byrd, a 2010 graduate of Cedar Ridge High School, said he wanted to learn to play after his band director at A.L. Stanback Middle School brought in a guest bagpipe player. Byrd went on to play with the Seven Oaks Pipes and Drums, where he competed for two years, but never dreamed he would be playing them in a college marching band someday. Byrd, who also plays tuba, baritone and didgeridoo, said he was inspired to join the WCU band after learning more about the group from a close childhood friend, WCU trumpet player Jay Chamberlain, and seeing the band perform at Cary Band Day. Bagpipe player Ezra Byrd rehearses on Dec. 20 in the giant "U" of the Western Carolina University Pride of the Mountains Marching Band's field show "Rock U." Byrd said his home in Mebane is a small place that some might think is the “middle of nowhere” and feels more like a series of farms and neighbors than it does a town. “But I can’t say that I would have traded it for anything, or anywhere else,” he said. Byrd will play bagpipes for the Pride of the Mountains Marching Band’s show “Rock U” Dec. 30 at the Tournament of Roses Bandfest (a portion of proceeds benefit the WCU band!) and tuba in the Rose Parade, which begins at 11 a.m. EST Jan. 1.